Opinionated Gamers Talk About Lords of the Eastern Reach at GenCon! 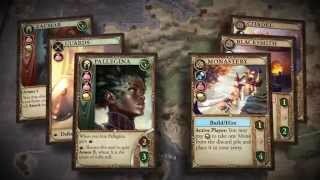 Matt Carlson from Opinionated Gamers breaks down how the Pillars of Eternity: Lords of the Eastern Reach physical card game plays in his GenCon report! Copyright © 2015-2019 Zero Radius Games LLC. Pillars of Eternity © 2015-2019 Obsidian Entertainment, Inc., used under license. All Rights Reserved.